This set was designed to serve a niche market: New Yorkers still getting their electric power from the DC grid. Just like in every other locality where TV service had been introduced, New Yorkers were clamoring to be first-time set buyers in the early 1950s. Even at that time there were seven New York TV stations to choose from. 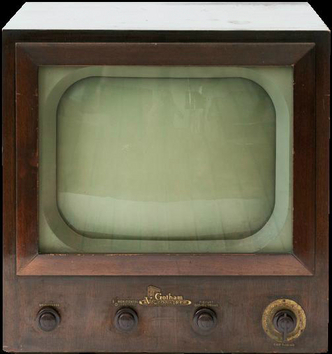 Unfortunately, many Manhattan residents had not a single TV model to choose from, even in a showroom crowded with sets. The reason: their electrical service at home supplied 110 volts DC, which would literally destroy an ordinary receiver. 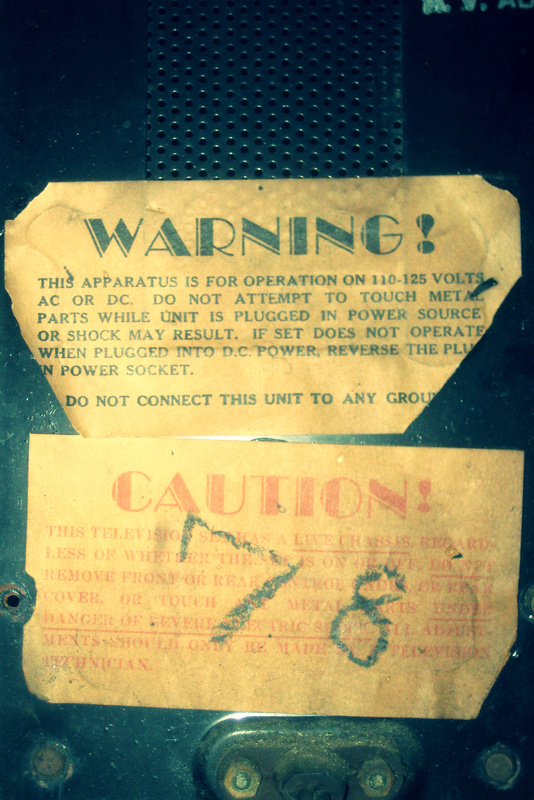 Only a handful of major manufacturers (notably Emerson and Raytheon) ever offered any true AC/DC TV sets. 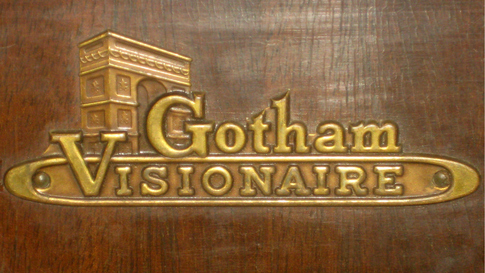 All that's left sixty-something years after the fact is conjecture, but it appears that New York wholesaler Colen-Gruhn sought a manufacturer to fill the demand for large-screen television sets in areas of Manhattan where the original Edison DC service still hung on. 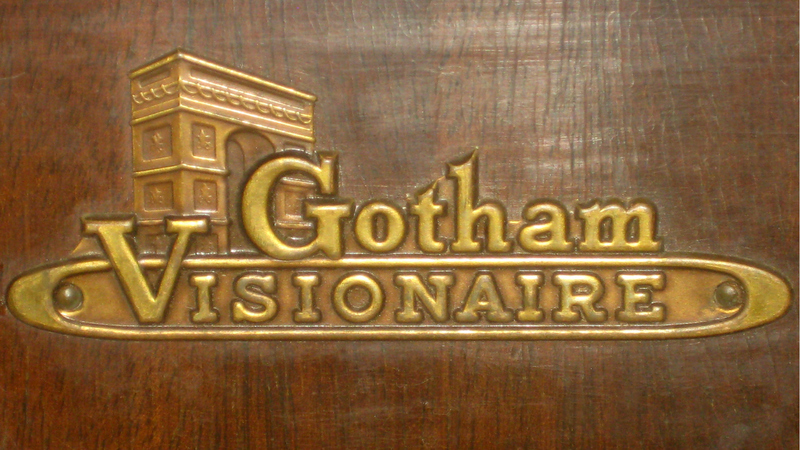 The company that stepped up to serve that niche market was Harold Shevers, Inc, manufacturer of the Gotham Visionaire. This set appeared on eBay in August of 2012. The seller had spotted it at a garage sale a number of years earlier and bought it, not to restore, but as a retro decoration for his apartment. The set's trip from Gotham City to the Tulip City was delayed by a series of disasters--first Hurricane Sandy, then some disasters of a more personal nature thwarted transportation plans. 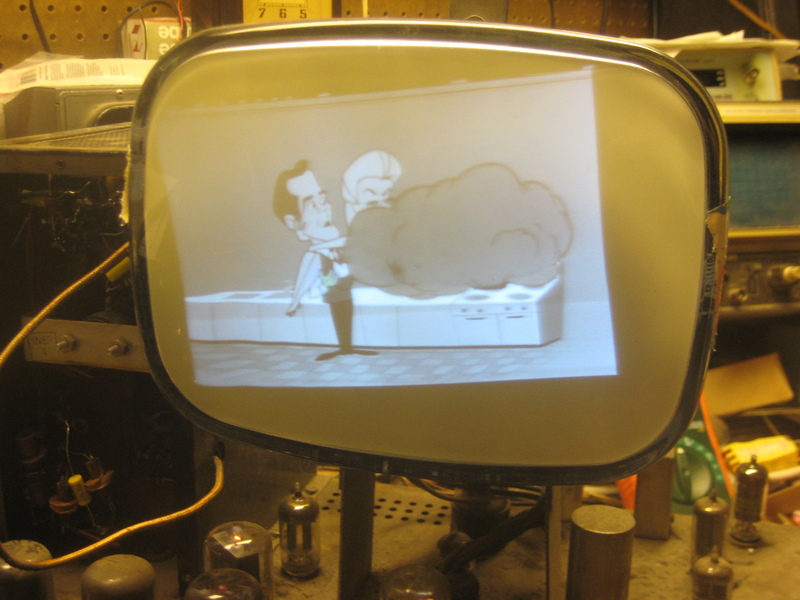 Eighteen months after it was picked up from the seller for interim storage, Kamakiri delivered it to the 2014 Early Television Convention (his first) which I also attended. 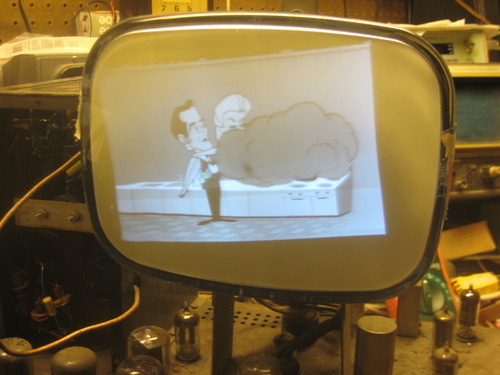 Once home, the first order of business in preliminary inspection was to test the CRT. A loose base is hardly uncommon, but in this case the base was so loose that I wrapped a bit of duct tape to secure it to the neck in order to avoid shorting twisted leads. First I set the filament voltage. I had to turn out the lamp in the room to confirm that the filament was indeed lit. Then the shorts test, which the tube passed. Then the balance setting--and a hint of trouble ahead, as there was no response to the adjustment. Finally the test for emissions: zero. Just as I reached for the tester socket to see if a wiggle might reveal a broken connection--poink--the filament went dead. At that point there was little doubt as to what was going on, the diagnosis of a tube-at-atmosphere confirmed once removed from its mountings. 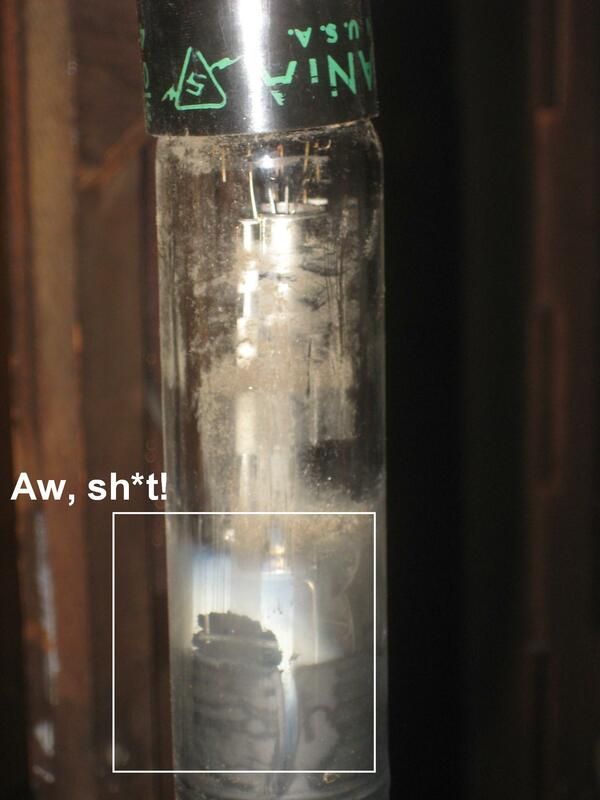 Only then was the vague sound of glass particles grinding noticed as I wiggled the tube base. Apparently the all-too-exposed neck had been bumped at some impossible to determine point in time and, rather than breaking with a rush of air that would manifest itself as a hole blown in the phosphor coating, a mere hairline crack allowed air to slowly displace the vacuum. So I needed a 17BP4. With a nominal high voltage supply of only 11KV for a tube designed to be used at up to 16KV, I needed a bright one. I eventually harvested a like-new aluminized tube from a rather forlorn combo set that wasn't anywhere on my restoration radar. In the meantime I would make use of an 8XP4 for testing. However, I needed to do a few things before I dared apply any power. 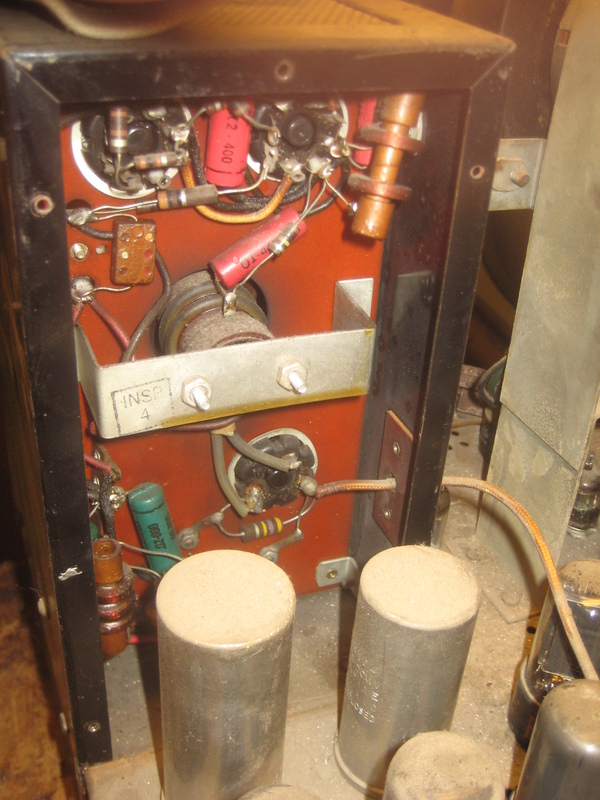 I removed the failure-prone selenium rectifier and bypassed the original 400 mf filter cans for a pair of new 470 mf, 160 v caps--hardly a common value to say the least, but necessary for half-wave rectification in a TV application due to the high current demand. It took a couple of tries to get the right value power resistor to compensate for the absence of the selenium's built-in voltage drop. In the end I went with 1 ohm, which certainly must result in far less drop than there was across the selenium even when new, but was the only way I could match the voltages on the schematic with a 115VAC input. It's hard to believe those readings could have been anywhere close to values given in the schematic when originally plugged into DC. The photo above was taken before I started any work on the set. 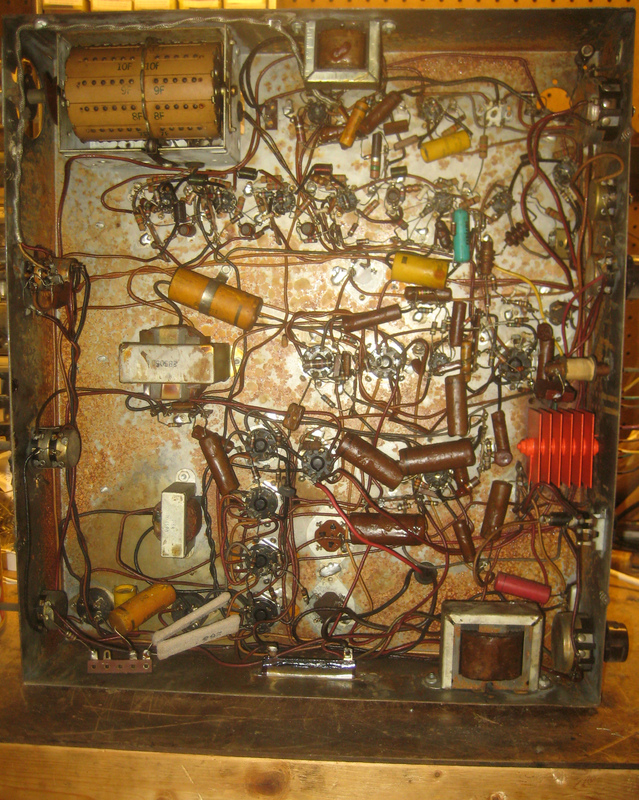 In the lower left corner you can see the sockets for the two four-pin 1-Vs. To quote one of the consultants for this restoration, "who the hell used 1-Vs after the 1930s?" Just to the right are the four parallel-connected sweep tubes. At far right is the selenium pile, which remained in place only just about long enough to snap this picture. 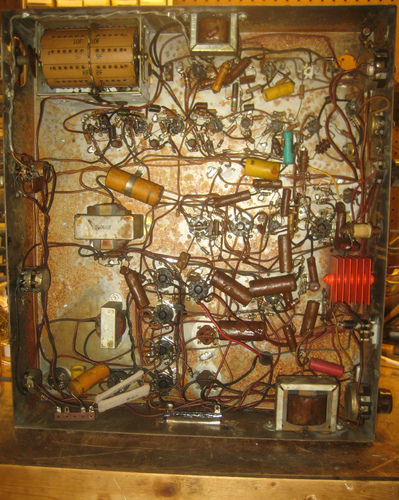 I also replaced the paper capacitors in the HV oscillator section before I applied any power. Those Sangamo caps have a particularly bad reputation, and this was one section I wanted to make sure would work, as it is obviously critical to assessing the condition of all the other sections. I was at all times cautious about powering this set on due to its hot-chassis design. First powerup was very encouraging, producing a clear and fairly sharp picture with nice sweep considering the paper capacitors in any section outside of the cage had yet to be changed. The only bad new was no sound.